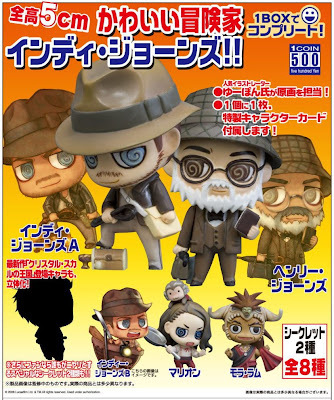 A Rinkya Blog: Indiana Jones Japan One Cent Figures SO CUTE!! so maybe Cute is a tad bit offensive to the male ego, but these figures are adorable! They release in late June, but can be pre-ordered via Rinkya Stores. 4235 yen each (approximately $42 USD) 6 figures and TWO secret figures! As usual, we will keep you updated on the blog with all summer blockbuster releases collectibles from Japan! Hey, you could buy these and play the new Richard Cheese Indiana Jones theme song.